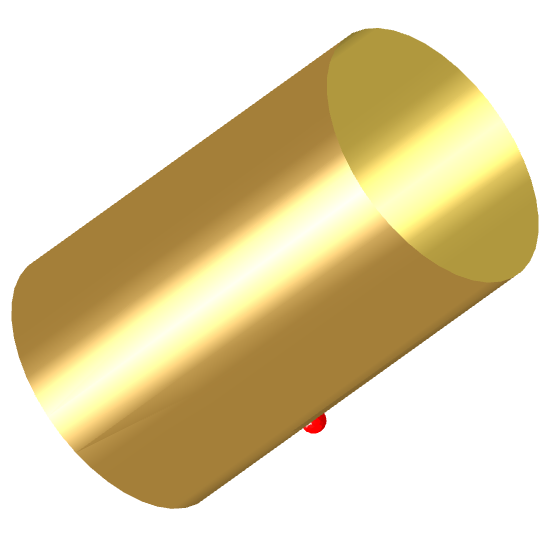 Image of the Pin-fed Circular Waveguide Antenna ("Cantenna"). The Circular waveguide antenna (often called "Cantenna") is a simple microwave antenna. It is used in applications demanding a robust, low-cost uni-directional microwave antenna, such as wireless networking (both stand-alone and as a reflector feed) and consumer-grade RADAR applications. Although the axial symmetry makes it capable of handling any polarisation of the exciting fundamental (TE11) mode, the pin-feed design provided by Antenna Magus is for linear polarisation only. The Circular waveguide antenna can be seen as the simplest member of the conical horn antenna class, representing a conical horn with no flare. It has moderate performance capabilities: performance bandwidth of up to 20% and maximum gain of 8 dBi. The following graphs are taken from an Antenna Magus performance estimation for a 50 Ohm design at 3 GHz. Estimated performance graphs of a Cantenna designed at 3GHz.